There’s no denying that durians are the Kanye West of fruits: you either hate it, or you love it. Intensely. Some love its ‘aromatic’ smell, while some just think of it as pungent. Nonetheless, its title as the king of fruit still stands. With Singaporeans’ undying love for durians, Grab announced that it’s bringing back its GrabDurian service before this year’s durian season ends for good. Returning for the 4th year in a row, this service allows you to get Mao Shan Wang durians delivered directly to your doorstep. Each box of GrabDurian contains at least 400g of MSW flesh (at least one durian’s worth of flesh) so you don’t have to hassle over de-shelling its thorny husks. According to Grab, these MSW durians hail from Bentong in Pahang, Malaysia, which is a province traditionally known for having exceptional MSW durians grown from old trees. These durians are freshly delivered to Singapore every morning. The GrabDurian service is available from November 22 till the end of the year. Users can order via GrabFood from 10am to 12pm daily, and receive it between 2pm and 6pm on the very same day. Each user is limited to order only up to 5 boxes per order — stocks are limited, so order early to avoid disappointment! To ensure the quality of every box, Grab said the prices for the durians may vary on a weekly basis but it assures that it will “try in earnest to offer [users] the best value for [their] money”. 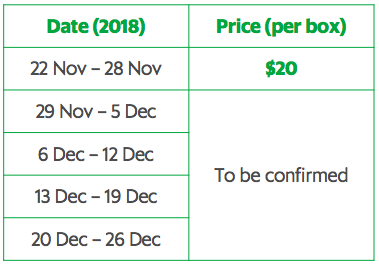 This week (Nov 22 to 28), GrabDurian is going for $20 per box. The pricing for the remaining dates are to be confirmed, but you can follow their Instagram stories at @GrabFoodSG every Thursday for the latest updated rates. Users also get to enjoy free delivery with the the promo code <DURIAN> when you order a minimum of $40 worth of durian in a single order. GrabDurian is unfortunately not available islandwide. If it is listed under the “Featured Partners” on the GrabFood app, then good news: it delivers to your location!